The 10 very spacious and luxurious suites at Lions Valley are cleverly decorated to give them completely different identities based on different themes! We love how each suite has a unique theme – have a look through the pics and see which of them take your fancy! You have 2 private baths and twin showers too (both indoor and outdoor) – it adds up to a wonderfully romantic (and very clean!) experience! 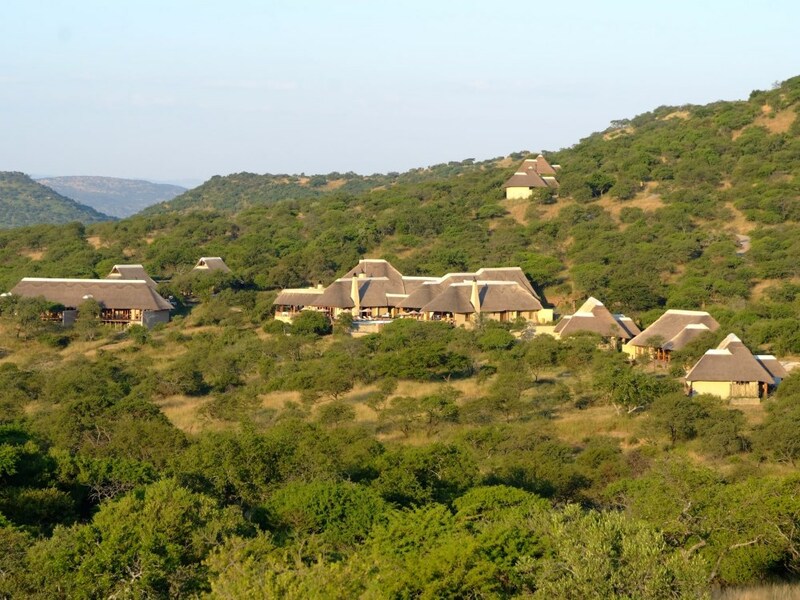 Lion Valley Lodge is very close to both Durban and Johannesburg (in fact it’s way closer to Johannesburg than Kruger!) making it an easy weekend getaway! If you fall in love with a specific room there’s obviously no guarantee that it will be available when you want to book – but we’ll definitely try to get it for you! the décor of each suite have been chosen with flair and no small amount of imagination to follow a different individual theme so the rooms all manage to look and feel quite different – have a look and see which of them you fancy! 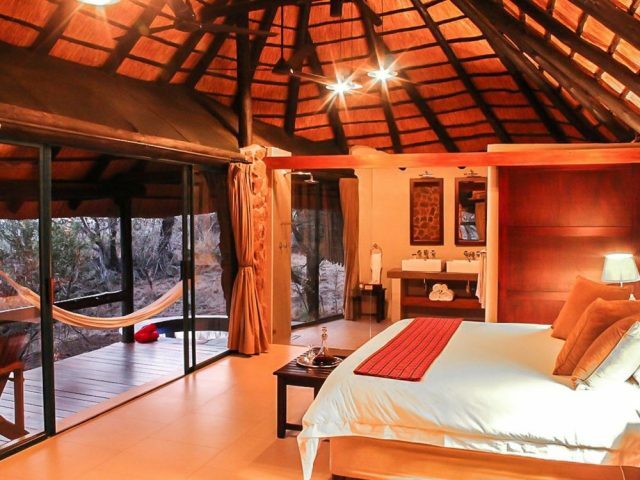 Lions Valley Lodge is one of the newest of the growing number of excellent lodges found in the up and coming Nambiti reserve. Already though it has carved out a competitive niche for itself by way of boasting a couple of unique selling points: firstly it is one of only a couple of lodges located in the central area of the reserve (which aids game viewing considerably), and secondly the lodge’s designers’ have successfully pulled off a unique creative concept by giving each room a completely different identity. The décor of each suite have been chosen with flair and no small amount of imagination to follow a different individual theme – so whilst the rooms themselves are all basically identical in terms of size, layout and facilities, they all manage to look and feel quite different. So what are these themes? Going in alphabetical order rather than preference (have a look through the images and see which of them tickle your particular fancy!) these are as follows: the Africa Suite which sports natural hides, traditional wooden masks and tribal cultural artefacts; then the elegant décor in the Bird Suite is a reflection of Kwazulu-Natal’s abundant indigenous birds; the Livingstone Suite which pays homage to the legendary 19th century explorer David Livingstone; the décor of the Ndebele Suite features beaded tribal artwork, cultural artefacts and colourful textiles, whereas the Nguni Suite layout uses genuine Nguni Cattle hides and leather items as a mark of respect for the noble indigenous herds; one of our favourites is the Romance Suite which boasts a collection of African fertility symbols sure to kindle the flames of passion; the Safari Suite recalls the nostalgia of the early years of African exploration and “going on safari”; the Savannah Suite which features the lovely neutral colour palette of the bushveld; then another favourite, the Spaza Suite, which gives guests a fun taste of the traditional African trading stores known as spaza shops; and finally the Zebra Suite makes attractive use of authentic zebra skins and zebra-patterned textiles. 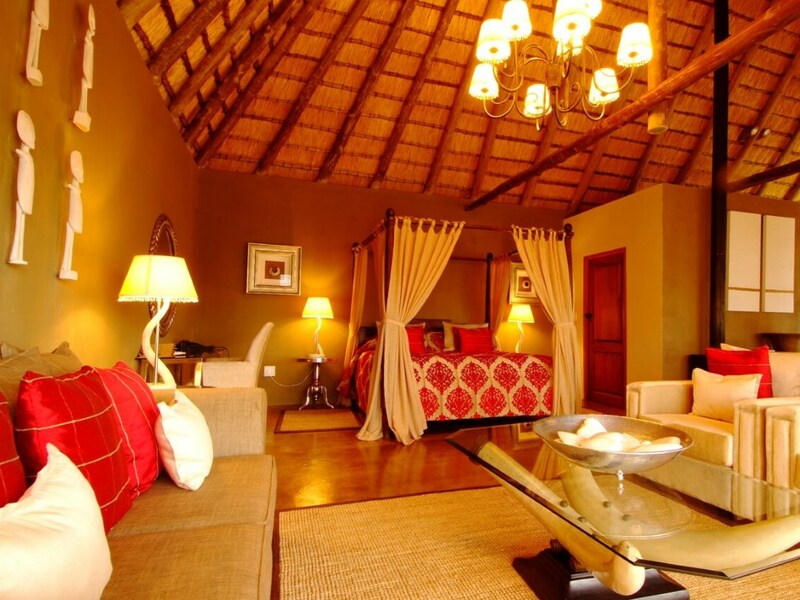 The main lodge area at Lions Valley is built in a traditional game lodge architectural style with natural tree-trunks supporting the majestic thatch roof. The magnificent entrance leads into the open reception area where you are immediately drawn to the awe inspiring view across the valley; this leads off to the library with a fireplace for cosy cold winter days – in fact this is the perfect place to discover more about the history of the area! The bar, dining room and lounge are elegantly decorated with extra ambiance lent by the traditional hunting trophies on display. The lodge has quite an unusual take on the usual traditional boma area – at Lions Valley, rather than being out in the bush, this is more an open courtyard with a large fire pit in the centre and with the dining area on the circumference under thatch. 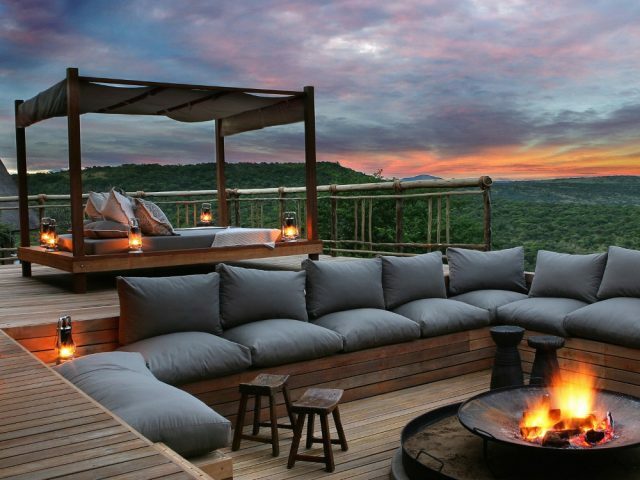 During the day, the place to be is the pool deck which offers a spectacular rim-flow infinity pool and comfortable poolside loungers where you can relax and absorb the glorious views of the bushveld and waterhole. And a special mention must go to the lodge’s adorable resident mongoose, Mango, who loves to enjoy a swim with guests on their shoulders! As mentioned earlier, Lions Valley is one of the very few lodges located in the central area of Nambiti (most of the lodges are located either in the very south or north of the reserve) What this means is that you avoid the drive that other lodges have to make up into the heart of the reserve – whilst they are obviously game viewing all the time they are doing so, they end up travelling the same roads repeatedly which can become less interesting to guests.The game viewing in Nambiti is good and getting even better as the animals become more and more habituated to the vehicles – whilst leopards as always could be tricky, you can expect sightings of the rest of the Big Five not to mention more unusual antelope like eland. But what’s also likely to catch your breath as you travel around the reserve are Nambiti’s stunning landscapes, with this definitely being one of the prettiest of all South African reserves! Please Note: Nambiti Private Game Reserve charges a Nambiti Rhino Protection Levy of R55 per person per night. This levy must be paid at the lodge on departure. Children 12 - 17 years when sharing with parents will be charged a teenage rate per night. As the lodge is not fenced and the lodge is in a Big 5 reserve, children are to be accompanied by an adult at all times. Children are to be supervised by their parents at all times. This is particularly important when on game drives, in the boma or dining room and while making use of the swimming pool and the surrounding area. The lodge staff reserve the right not to permit children on game drives if they feel that this could be to the detriment of other guests. Excellent accessibility from major cities, wonderfully stylish architecture and reasonable rates all adds up to an excellent value-for-money bush breakaway! 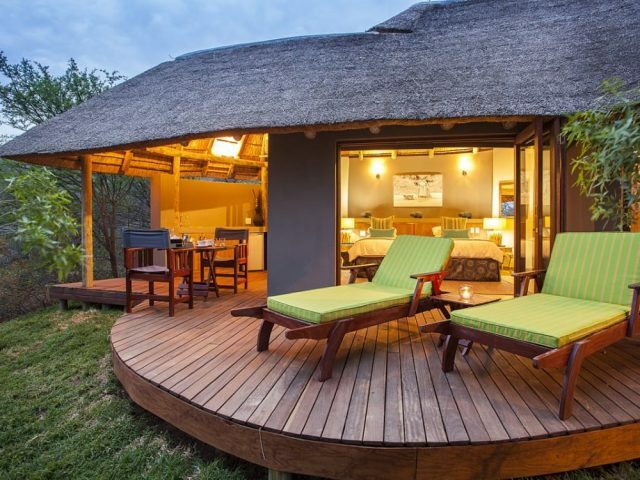 With its more contemporary styling and decor this is one of the top lodges in the Pilanesberg with just 5 absolutely gorgeous suites set within a tamboti forest!